Prime Minister Scott Morrison threatened to “pull levers” to get growth under control on Thursday, including sending international students to regional universities to relieve urban congestion as he puts together a formal population policy. 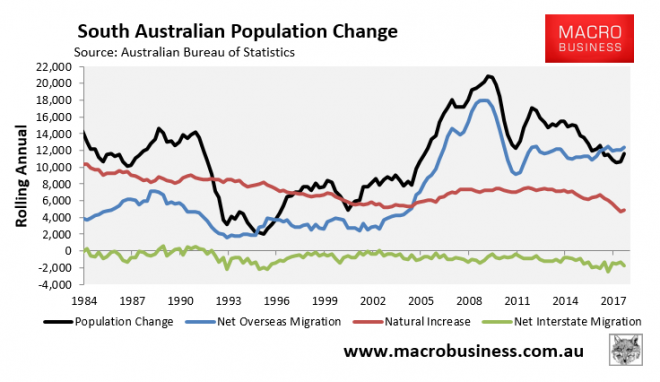 “Up in the north, they want more population, in Adelaide they want more population,” he said. The amendments successfully passed SA Parliament in November 2017 and stemmed from a Four Corners investigation alleging the exploitation and underpayment of migrant workers at various companies. “The whole regime will go,” Ms Chapman told the ABC. The move has been met with both support and outrage, with Business SA applauding the repeal but the Opposition and SA Unions vowing to fight against it. We can’t have that! The horribly conflicted Migration Council wants less protections and it must have its way. “In South Australia over the last five years, during the Census period 2011 to 2016, (we) grew at five per cent,” he said. “That’s faster than France, it’s faster than the UK, it’s faster than the US. So in international terms population growth has been quite robust. South Australian party leaders have butted heads over population growth at a debate hosted by the SA Press Club on Friday. While SA Best leader Nick Xenophon and opposition leader Steven Marshall highlighted the state’s rate of growth as an area of concern, Premier Jay Weatherill said he was “not a high population growth person” and neither was his government. “The notion that we’re a slow growing state is nonsense, it’s just that the rest of Australia is growing like a science experiment,” he said. Hardly looks like an “area of concern”, does it? The irony is that the SA labour market has been hollowed out by manufacturing-destroying exchange rate lifting policies of the growth lobby. Now it will be internally deflated instead. Get set for the crush-loading of Adelaide. Rising house prices, falling wages and reduced amenity for all. But how will house prices rise??? If migrants are earning peanuts and banks won’t lend, the prices are stuck aren’t they? Or have youse now come around to accepting the Peachy Position? No. Just relaying the paradigm. I’m not sure that I understand. Won’t more people mean more demand to rentals, thus pushing up rents (and yields), leading to more house investor demand? What’s the Peachy position? You’ve just stayed the Peachy Position. Well done. If Immigrants live 5 to a house, $10/hour x 5 males x 30 hours = $1500/week. That is enough to push up real estate prices in Adelaide. There is no cap on the number of male “students” that can come here – nor how long they can stay. Jacob, these hypothetical scenarios are all very well but as I’ve stated time and time again, living 3 or 4 to a room is not a stable long-term arrangement for people i.e. people do it for a short time but the aim is to improve their situations or start families. For sure, bunking down in a room with other people was me when I left home at 19 yrs old and didn’t have a pot to piss in but once I’d established a career and had the means I then rented my own joint. 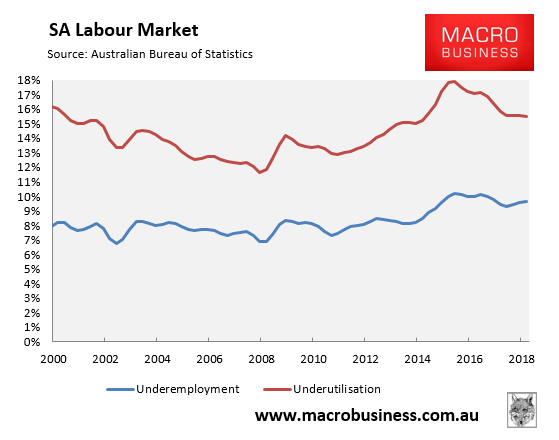 The strayan economy needs to create well-paying jobs to support people who want to buy over-priced homes and, as MB has pointed out numerous times, the economy has effectively been hollowed out: away from mining we are now a pure services-based country — a situation which is unsustainable. We can’t all get wealthy mowing each other’s lawns and providing tax advice to each other. And, as has been well documented here, wages are only going in one direction while the two main parties remain tethered to this ridiculous Big Australia policy so that’s hardly going to support house prices longer term. We’ve seen the peak in real house prices for sure. After Japan’s credit bust in the early 1990’s house prices fell for decades — in fact, Bank of America recently released a report stating that Japanese land prices rose this year for the first time since 1991! It’s well and truly over. I find Adelaide to be even more dull than Melbourne. Importing a massive chunk of human capital can only be a good thing. To be honest, I cannot see any negatives. Adelaide needs this boost to vibrancy so that people may actually visit there one day. It’s enormously fulfilling and gratifying. Can it just wait until I’ve upgraded my PPOR next year? That’d be great. Yes, “they” don’t really want the people here. Blue-ribbon Unley was one of the few electorates that had an explicit anti-migration candidate because the locals in their restored bluestones a stone’s throw from the CBD aren’t that keen on the apartment proposals being mooted for their backyards. Even in the Murdoch rag where 95% of the comments are batshiat crazy ‘reds under the bed’ insane on almost any issue, the articles pushing for more people are usually full of comments around traffic, hospitals and the (oh so quaint) “where are the jobs for them?”. The push for more people is confined to the party itself, Murdoch, a few property developers and a couple of industries that function entirely on migrant labour. Unfortunately still too many Liberal voters that don’t understand the party they used to vote for no longer exists in any recognisable form. The SA libs are just evil now. They didn’t used to be this bad. While Xenophon crashed and burned, I still think SA will be where the 2 party system dies first. That Labor could hold on as long as it did, and the libs didn’t win by much after 16? years tells you Marshall won’t be a long term premier. Yes… If the folks in Adelaide wanted to live like they do in Hellbourne or Skidney they would just move there. Most of the folks I know in Adelaide love it there for what it is. There are also issues with limit water supply. Up in the North…we do NOT want more population… just send them up into the build up and see how they cope… LOL..Darwin is already hard enough without extra population that has been forced to be here. People live up here for a reason and that is to get away from the crowds and congestion and over development of the southern cities/ states… Just go get fvcked! Greedy developers and chamber of commerce slave drivers..
Then again, Jay Weatherill lost the election. So perhaps SA wants a new dose of falling living standards. Yep. They voted for this. But I think Jay was no hero: he could have abolished the rural growth boundaries – not nessasarily around Adelaide but around Whyalla, Bordertown, Keith. That would have crashed real estate prices in Kaniva (Victoria) as well because Bordertown is only 47 km away. Rubbish…Dads everywhere drive hundreds of kilometres to Kaniva just so they can make the “Kaniva icecream?” joke. Bordertown’s got nuthin’. the city where nobody can hear you scream. More population for Adelaide will be a disaster. The place is already bursting at the seams. Yes it hasn’t had anywhere near the inflow as Melbourne and Sydney… well yeah, it’s also one-quarter the size. The infrastructure here is sized for a city of about 1 million people (which it was many decades ago) and even creeping up to 1.3 million you can see the issues. The city itself is surrounded by suburbs with dual-lane arterial roads, not six or eight lane mega-highways to get the traffic in and out. The (successful) industries are all located regionally – wine, agriculture, aquaculture, renewables. The city is *already* overwhelmed with dodgy businesses run for the sole purpose of business migrant visas (how many broth… er, ‘massage parlours’ do you need in a square mile?). Some of my favourite examples I walk past every day include: a Chinese ‘culture’ shop full of kitsch whitewashed artworks and nicknacks that never has a customer; the ’24 hour internet gaming cafe’ that I’m yet to see a customer in, the all-Chinese real-estate pop-up booths that seem to be unstaffed, the bizarre store that seems only to sell set-top boxes of some sort (that just opened – in late 2018). Then you’ve got the banh mi place sitting across from the Homeland Security and ATO office where they tell you ‘no discount’ when you pay with a credit card. I mean you couldn’t make this stuff up. All more population will do is ‘Tasmania-ise’ the place. More homeless, more unemployed, more displaced locals. Honestly the rest of Australia (and MB it seems) appear to believe there’s a hundred jobs in the paper every day to build submarines or something. I guess at least we do have a big showgrounds near the city so maybe they can take tips from Hobart on how to manage turning the place into a camp for the homeless. SA doesn’t have the tourism potential that Tas does. What is the rationale for employing these people? Construction? I was absolutely shocked and terrified by rush hour traffic in Adelaide. Horrible.